Mapperley is a beautiful parkland course with rolling fairways which have, for more than a century, presented golfers with an interesting challenge from the tee. The 600 plus members also find the tight greens testing while they soak up the stunning views of the nearby Gedling Country Park. Michael is part of a four-man greenkeeping team that works tirelessly to keep the course in immaculate condition all year round. He admits that it can, at times, be a challenge with just four in the team and that it is therefore imperative they have the correct maintenance equipment in place. In particular, cutting by hand in summer at Mapperley is just too tall a task for the four-man team but in winter there is no other option. “You don’t get much hillier than Mapperley, says Michael. 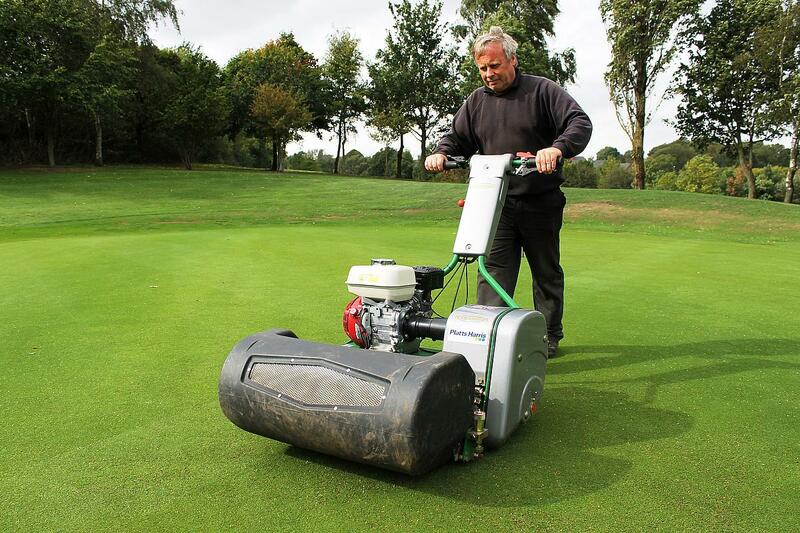 “It can get incredibly wet in winter and no vehicle can get to some of our greens without either marking the ground or sliding all over the place – and that can be very dangerous. Michael visited BIGGA’s BTME exhibition to see what was on the market and after visiting a number of stands he drew up a shortlist of potential greens mowers – one of which was the Dennis Razor fine turf mower. Upon returning to Mapperley, various mowers were demonstrated but for Michael and the team there was one which particularly stood out. Superbly balanced and ideal for golf greens and other fine turf surfaces, the Razor features a 560mm (22in), 11 blade cutting cylinder for a perfect finish. An ultra-short wheelbase ensures easy manoeuvrability and excellent performance, even on undulating surfaces. The Dennis Razor encompasses the simple ‘no tools required’ click height adjusters for quick and easy operation, a feature which particularly struck a chord with Michael and his team. “I don’t like machines with too many gizmos - I like one that is simple, straight forward to use and does the job which it is supposed to do. We’ve been using the Razors for a year now and they have been fantastic. “In my opinion the best features on the Razor are that they are reliable, incredibly well built and easy to use. They keep the weight off the greens in winter and the cut that it offers in terms of presentation is fantastic. Since we’ve been using the Razor the greens have been a different quality.